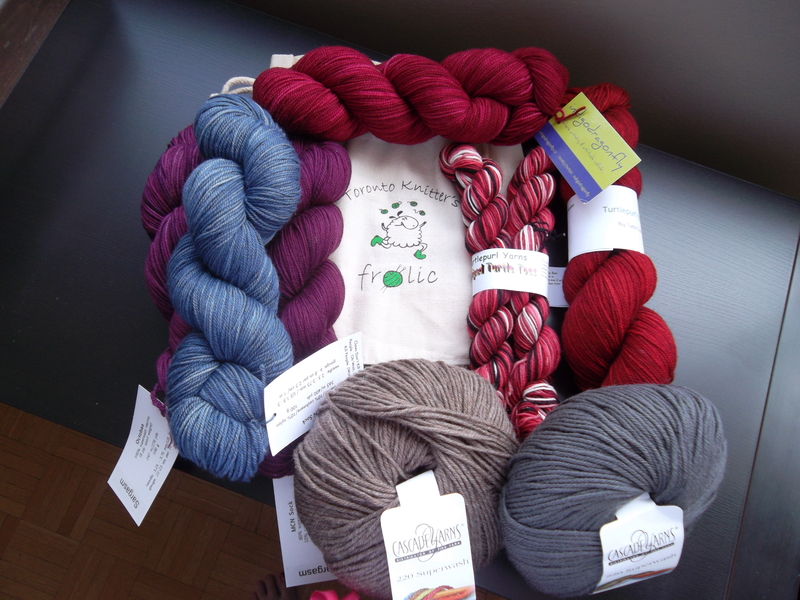 Saturday was the Downtown Knit Collective’s Annual Knitter’s Frolic…my third in a row. This year, I went to hang out with friends in line at about 8:15 and pretty much stayed to the end. I met up with Shireen over at The Blue Brick, her partner Tito and our friend/spinning instructor Leslie and we patiently waited until the doors opened at 9 AM. I bee-lined for the indigodragonfly booth, because I had a bag of single skeins I was looking to co-ordinate, for later use as a two-colour shawl, and I wanted to nab Kim before her booth was swamped by other shoppers. One of the skeins I was looking to match was a special, limited edition one from Fibre Fling a few summers ago, called “How Many Minions Does It Take To Screw In A Lightbulb?” Kim placed a skein on either side; the blue, she said would be a good choice if I wanted a more muted effect and the purple would be better if I wanted something that would pop. I took one look…and I was a goner. Colour Affection, anyone? I picked up a few more skeins from her, including one in Octobaa, a new DK weight yarn which is crying out to be yummy socks and proceeded merrily on. 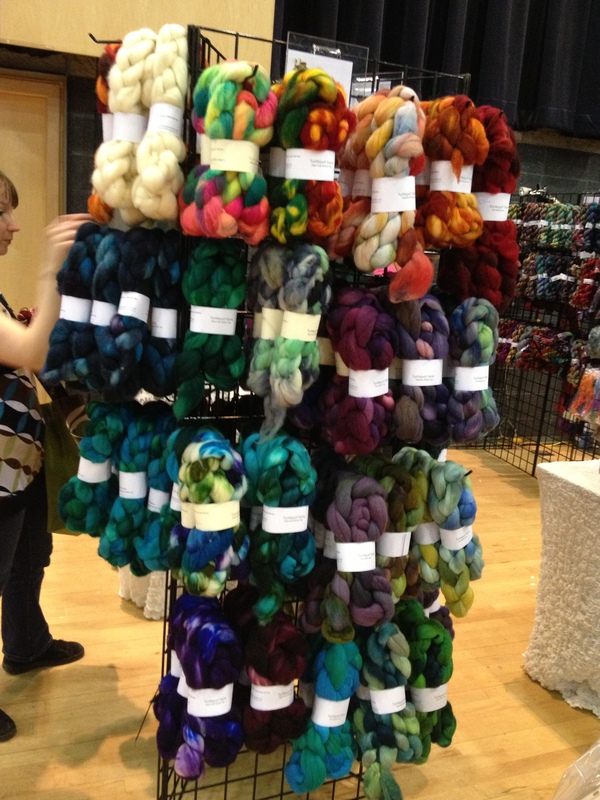 I did manage to avoid buying fibre….even though TurtlePurl’s display nearly weakened my resolve some. I met up with varying friends through the day, which was why I ended up being there pretty much until they closed the place down. 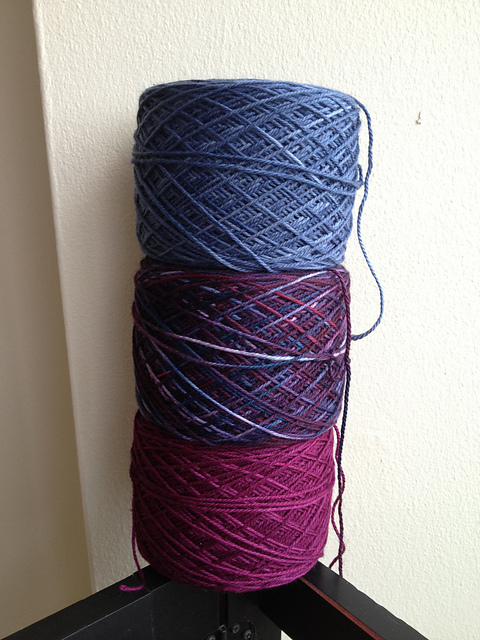 Over the span of the day, I grabbed a couple of skeins of TurtlePurl yarn (she makes some nice self-striping stuff! ), and some Cascades 200 Superwash for heavy socks for Chase, along with a bamboo sock-sized circular so that I can take sock knitting on the plane to New York next weekend. This entry was posted in Uncategorized and tagged frolic, indigodragonfly, turtlepurl by Rayna. Bookmark the permalink. That’s going to be a stupendous Colour Affection. Man, those colours together! Gorgeous.